Making Tetrahedral Kites - Step by Step - MBK 4-Cell Skewer Tetra! Step-By-Step - MBK Skewer Tetra! 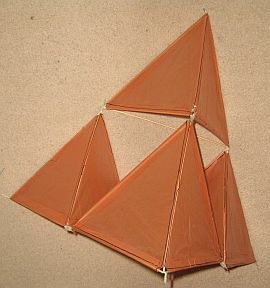 Very large tetrahedral kites are a pain to build and a pain to setup on the flying field. Easy but tedious. However, the more pain, the more gain as the sight of a huge complex tetra 'nailed to the sky' in a stiff breeze is awesome indeed! If you want to just get started in this direction, without having to take too many pain-killers ;-) a good design to try is the 4-cell tetra. See the photo. One of these can be made small enough so it fits neatly inside the boot of a modern car, fully ready-to-fly. 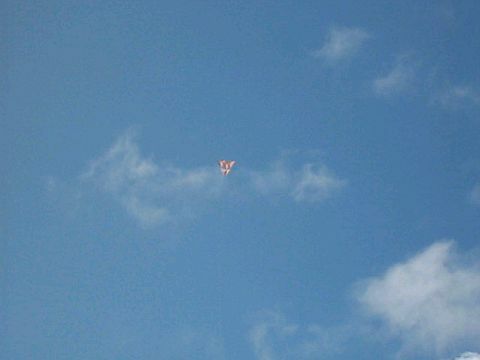 This kite likes moderate winds, but is still light enough to be affected by thermals. 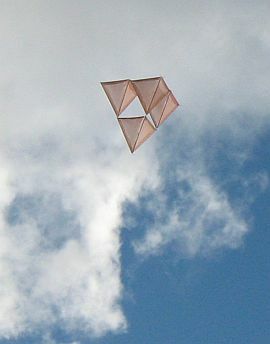 Although time-consuming, constructing tetrahedral kites is fairly easy to understand and carry out. No tetras in that book just yet. 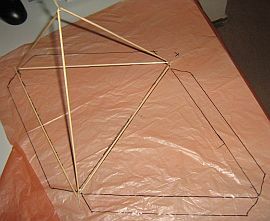 A triangular base of spars comes first. From each corner, another spar is attached, with all 3 of these coming together at the top. All spars are of exactly the same length. When all 4 vertices are securely joined, a sail is attached to 2 sides. Any 2 sides will do, due to the symmetry of the shape! This whole thing is 1 cell. See if you can pick out the 4 individual cells of my skewer-and-plastic tetra in the photo up there on the right. Oh, by the way, don't try flying a single cell - it simply will not be stable. 4 cells is the minimum! Make a single tetrahedral cell as described above. Copy it to make 3 more cells. Put 3 cells on a flat surface, in a triangular arrangement, so there are 3 points of contact between them. The sails should all be oriented the same way, and none of them should be lying flat on the flat surface! Fasten the cells together at their points of contact. 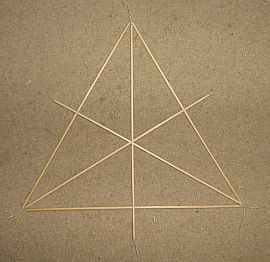 Add the remaining cell to the top of the 3 connected ones, arranging the sail in the same direction as the others, and fastening the 3 points of contact. Lastly, attach a flying line and bridle so the arrangement looks like the photo. Then go out to fly! However, unless the kite is super-light, it might need a fair amount of breeze to fly successfully. A very high proportion of the weight of tetrahedral kites is in the spars. Wait for a windy day, or put your running shoes on and tow it like an exuberant kid! You might first have to settle on the exact materials and techniques you wish to use. All sounds a bit hard? Guess what, I'm going to show you the relatively quick and easy way to make a 4-cell tetra that loves light-to-moderate winds! 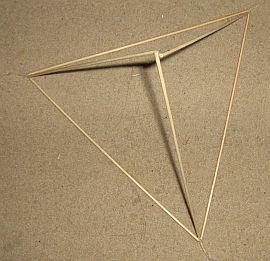 Bamboo BBQ skewers are a great spar material for small tetrahedral kites, being very stiff and strong for their weight. A cheap sail material is garden bag plastic. The thinnest, cheapest ones can be used, or you can use thicker brighter-looking plastic for more durability and perhaps better looks! I decided to whip together a 4 cell tetra just for readers of this page! Using the cheapest bamboo skewers and garden plastic. Take a 30 cm (12") bamboo BBQ skewer, and attach a length of clear sticky tape to one end as in the photo. The tape should be about as long as an average adult middle finger. The skewer is sitting on half the length of the tape. Carefully roll the skewer in your fingers, attaching the width of the tape to it as you go. Then, keep rolling the skewer while drawing your fingers away from the tip, so the free length of tape spins itself into a tight cord. It should be pretty clear in the photo. Attach tape to the other end of the skewer in the same way. Then do both ends of another 5 skewers! 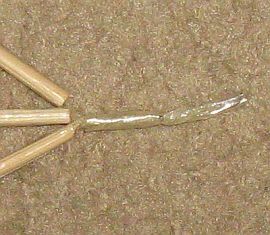 Arrange all 6 skewers as in the photo, and note how the little cords of rolled-up tape overlap each other at the 3 corners of the large triangle of skewers. Here's a close-up of one of those corners. The 3 little cords have been twisted together, then another short length of tape has been wrapped around the 3 cords several times. The 3 skewers are now joined securely at the tips. Do the other 2 corners too! Finally, draw those 3 free skewers up away from the floor, and secure the 3 tips together in the same way as all the others. (Cue trumpet flourish...) Tada! A tetrahedron. 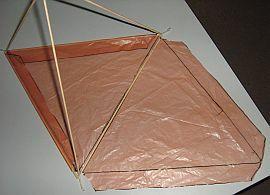 Take your tetrahedron and lay it on a sheet of plastic that you would like to use as sail material. Trace around the inside of the triangle that is in contact with the plastic. Use a black permanent marker pen. Flip the tetrahedron over, along one side, without letting that side slip or change position. Now trace around the inside of the new triangle which is in contact with the plastic. Finally, draw tabs in, next to 4 of the sides of the diamond shape you have drawn. See the photo. I was in a hurry, so just eye-balled it apart from ruling the longest straight lines in with a ruler! Just allow plenty of width to fold each tab over a skewer. Next, cut all around the tabbed diamond shape with scissors. 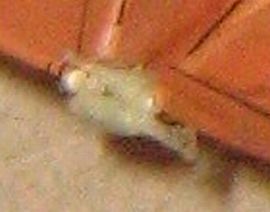 The photo also shows a couple of the tabs folded over and stuck down with sticky tape. The tetrahedron has been flipped back to its original position. Look at that! A complete cell, where the remaining 2 tabs have been folded over and stuck down. OK, now arrange them as in the photo. All the sails should be facing the same way. At every corner point where the tetrahedrons touch, there should be 2 short sticks of tape. One coming from each tetrahedron. Here's a close-up of one join between tetrahedrons. See how the sticky tape sticks point in opposite directions. Lay them side by side and wrap more sticky tape around the whole lot, using several wraps to make it strong. 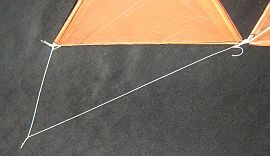 Take a length of 20 pound flying line, about 2 skewer-lengths long, and attach it to the kite as shown in the photo. I just used Half-Hitches around the sticky tape at both points. 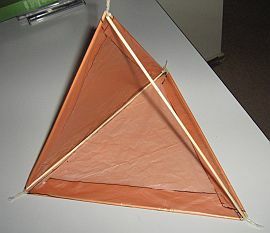 Small tetrahedral kites such as this one do not require more than 20 pound line. Also tie a small Loop Knot into the bridle, so the line angles are approximately as shown. The exact position is not as critical as for other types of kites. It should fly fine! Yes, ordinary drinking straws, in either paper or plastic. Now that you know all about the details of construction, you should also be able to whip up a 4-cell tetra using straws instead. One quite popular method is to feed a line through each of the 6 straws, leaving an ample amount hanging out each end of the straw. A simple 3-strand knot at each vertex keeps the whole structure rigid. Well, rigid enough for the purpose. The extra lengths of line at each vertex can be used to tie the vertices of several completed cells together. light fishing line - could be fiddly! With use, the line can tend to cut into the ends of the straws and shorten the life of the kite. One proven idea for plastic straws is to carefully melt each end of each straw, by touching it to a hot plate. Just enough to soften and thicken the wall of the straw a little, right on the end! For paper straws, you could try a single wrap of narrow sticky tape around each end of each straw, for reinforcement. This would also increase the weight of the kite a little, but it's worth a try. One thing to try, if you have the patience, is to connect four 4-cell tetrahedral kites together to form a 16 cell! It will fly more stable than the 4-cell, so should have a better wind range. This page hardly scratches the surface of this fascinating corner of the kiting world. Tetras can be tied together in an infinite variety of configurations, requiring complex bridles to match. More durable tetras can be constructed from fiberglass or graphite spars and covered with rip-stop nylon sails like most retail kites. With sufficient spar thickness and stiffness, these kites don't need the full 6-stick tetrahedron cell construction. Instead, other forms of bracing can be used, which use far less spar material.